The Innevation Center is a one-of-a-kind public/private conference, collaboration & coworking environment created by Switch. The mission is to boost and diversify Nevada’s economy. Below is top news that happened for The Innevation Center during the week of July 21st, 2014. Read more about the speaker and what he plans to presents in this VegasTech.com feature. 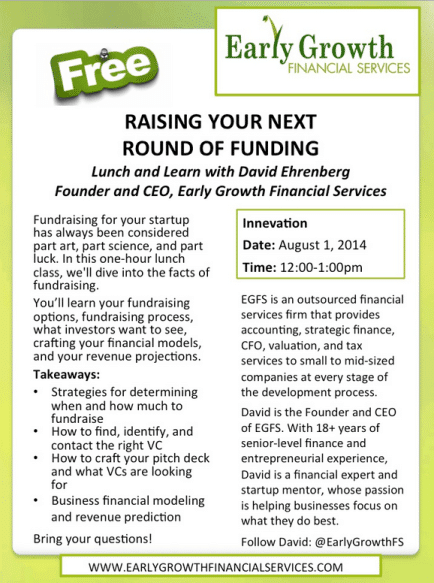 Early Growth Financial Services will be at The Innevation Center on August 1, 2014 from 12 to 1 pm with CEO David Ehrenberg presenting Raising Your Next Round of Funding. “The free event will benefit startups in every industry. This is an amazing opportunity to learn from someone with 18+ years of senior level finance and entrepreneurial experience!” The Innevation Center team wrote on their blog.